This week's cover strip features portal punnery with the Knock-Knock Door, swiftly followed by larks with luscious Lily Pop as she takes delivery of her copy of The Sunday Stunner. And where exactly is Cheeky's gaze directed in the final panel? Certainly not at Lily's face (or her hand which for some reason has turned yellow). 6 Million Dollar Gran is this week engaged in a search for her bloomers which have blown away with the rest of the contents of her washing line. In a convoluted plot, the lost laundry is propelled through the Earth's crust and the synthetic senior citizen burrows down to locate her errant undies in Australia, allowing another outing for that oft-used British comic device; depicting life in Australia as being upside-down. Do Australian comics show Britain in the same inverted fashion? There's further washday wit on page 7 as Calculator Kid enjoys another profitable day courtesy of his electronic chum. I always enjoy seeing Charlie's dad's extravagantly wavy moustache, the curls of which are echoed on young Master Counter's bonce. On Wednesday Elephant and The Man InThe Plastic Mac make their only crossover into Cheeky's Week as the toothy funster's Dad provides his grinning offspring with the latest copy of The Mystery Comic. This week's issue of the Mystery Comic is the only one to feature Why, Dad, Why? on the cover. As Dad expounds on the subject of gravity we learn why the Antipodeans depicted in this week's 6 Million Dollar Gran episode didn't fall off the planet. Usual Mystery Comic cover star Tub is entirely absent this week, and for the fourth time a Star Guest is occupying one of the pages of the perplexing publication. This time it's Uncle Rich and Willoughby of Super Store who are attempting to boost sales of Whizzer and Chips. As we return to the Cheeky Weekly section of the comic, an ad on page 21 informs us that readers of that very comic are this week enjoying a free sachet of milkshake mix as IPC's promotion reaches its penultimate fourth week. The toothy funster's comic will be the last title to carry a free packet of raspberry-flavoured powder next week. As of Thursday, the artwork duties on Cheeky's Week are handed over from Frank McDiarmid to Mike Lacey. On that same page Cheeky introduces us to a new pal, Zoot Soot the chimney sweep. Zoot will go on to appear in a further 13 issues of Cheeky Weekly. On the following page Jimmy Hansen draws his 76th and final episode of Skateboard Squad, although there is no indication in the strip that this is to be the last outing for the sensational skateboarders under this title. The intrepid trio will return as of the 26 May 1979 issue in their new guise of Speed Squad. On Friday Cheeky gets another eyeful of cracking crossing lady Lily Pop, and it seems to be doing his peepers no good at all. Luscious Lily delays a vital consignment of IPC product as she transports the toothy funster across the carriageway. Rainham reader Emily Jacob takes our toothy pal to task on the Cheeky Chit-Chat page regarding the What did YOU do today? 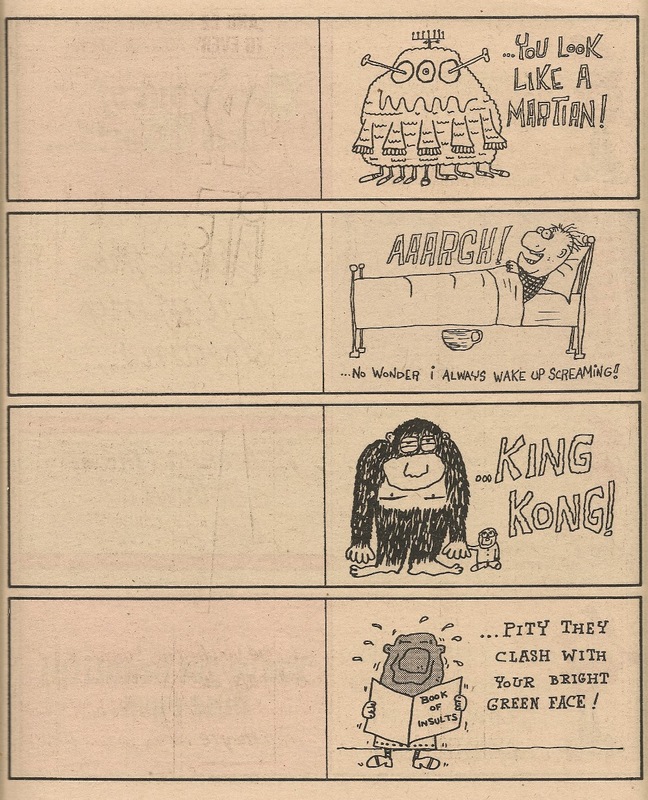 diary section which has been appearing at the foot of each daily Cheeky's Week page since 30 September 1978's revamp issue. Ms Jacob isn't happy about removing said sections from her comic, which is a little odd as I'd never believed the diary was supposed to removed. 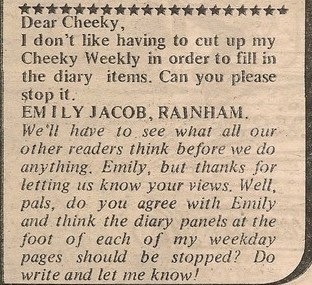 Cheeky democratically solicits reader reaction to the idea of ceasing the diary. On Saturday we see a selection of Cheeky's pals struggling with the curious culinary concoctions on offer at Auntie Daisy's party. Fortunately there's a happy resolution. The comic rounds off for the 6th consecutive week with a Burpo Special (this time focusing on Mechanic). 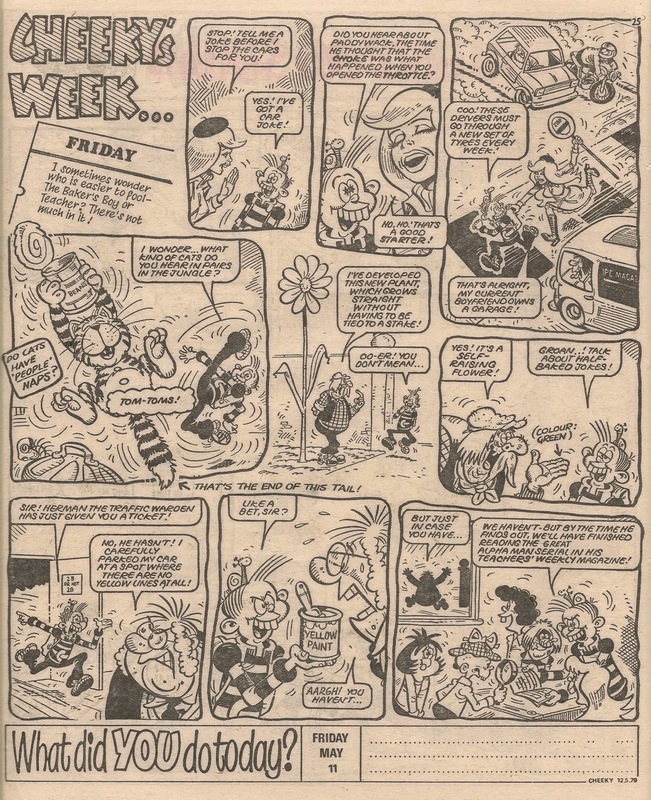 As mentioned above, the Cheeky's Week artwork duties in this issue are shared between Frank McDiarmid and Mike Lacey with, in a nice touch, the Auntie Daisy's party storyline being handed over between the two artists, each of whom contribute 5 elements of the toothy funster's week. Labels: cheeky weekly issue summary, What did YOU do today? Bruce has given us the opportunity to compare a Skateboard Squad strip with a story from the period after the daring trio metamorphosed into the even more intrepid Speed Squad (which, as I'm posting features items only after my Cheeky Weekly issue summaries have reached the commencement of the strips in question, I have yet to cover on this blog). The second strip sourced from the Mystery Comic to make a Star Guest appearance in another title (the first being Disaster Des) was Why, Dad, Why? 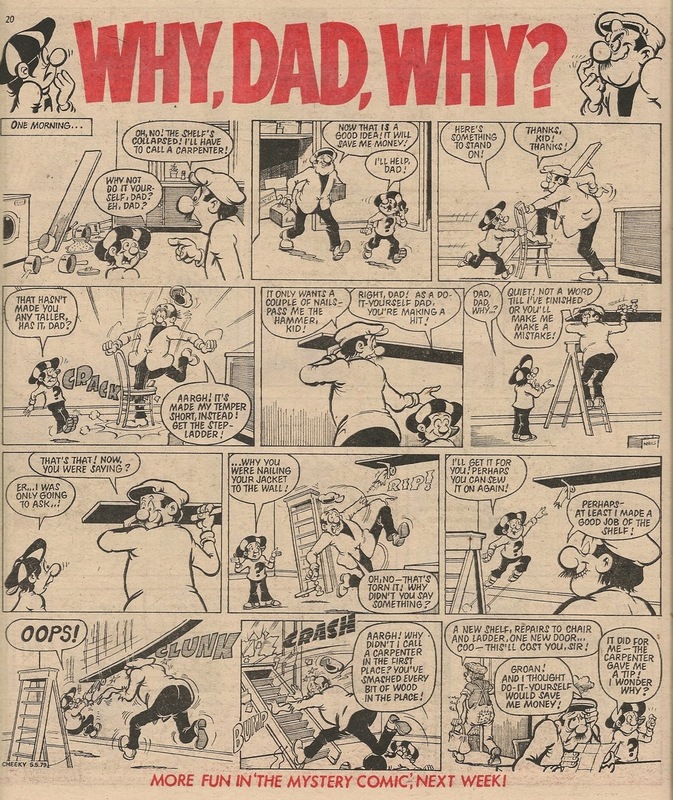 The exasperated dad and inquisitive offspring team made their bid to garner some new Cheeky Weekly readers in Whoopee's 05 May 1979 issue, the sixth week of that year's Star Guest promotion. Any Whoopee! Readers who were sufficiently engaged by the father-and-son fun portrayed above to place a regular order for Cheeky Weekly would have found that Why, Dad, Why? survived until Cheeky Weekly came to an end in February 1980 and was absent from just 9 issues in the remainder of the toothy funster's title's run. Sadly, however, Why, Dad, Why? 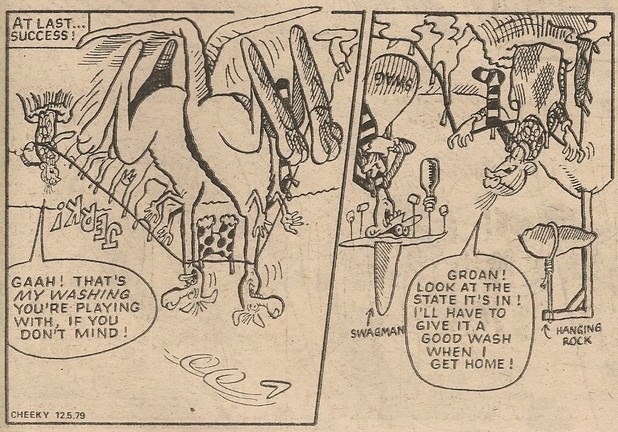 wasn't one of the strips that was merged into Whoopee! when Cheeky Weekly folded. The story featured in this particular Star Guest was new and never appeared in Cheeky Weekly. 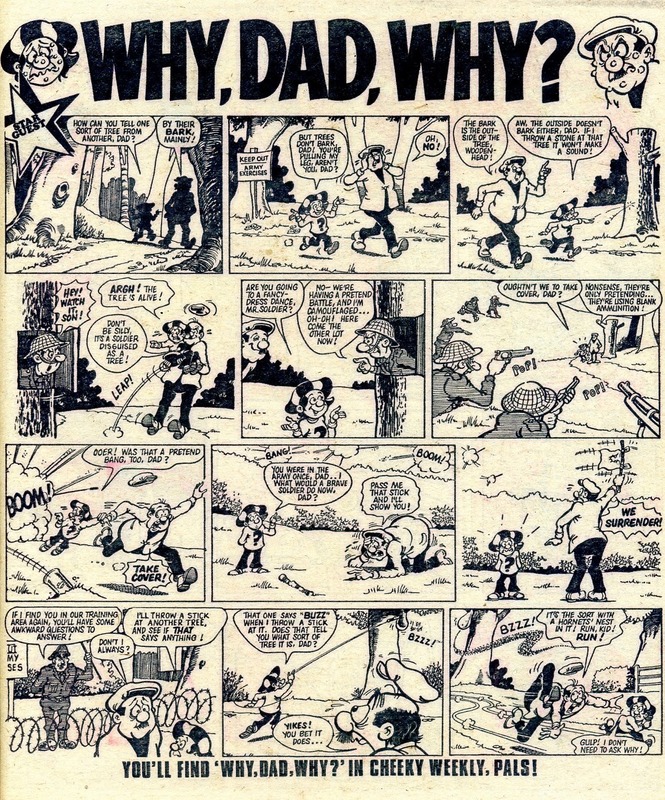 Like all the WDW strips in Cheeky Weekly, the title banner above this Star Guest included a unique depiction of Son and Dad, related in this instance, as was sometimes the case in Cheeky's comic, to the events depicted in the strip itself..
Labels: Star Guest, Whoopee, Why Dad Why? 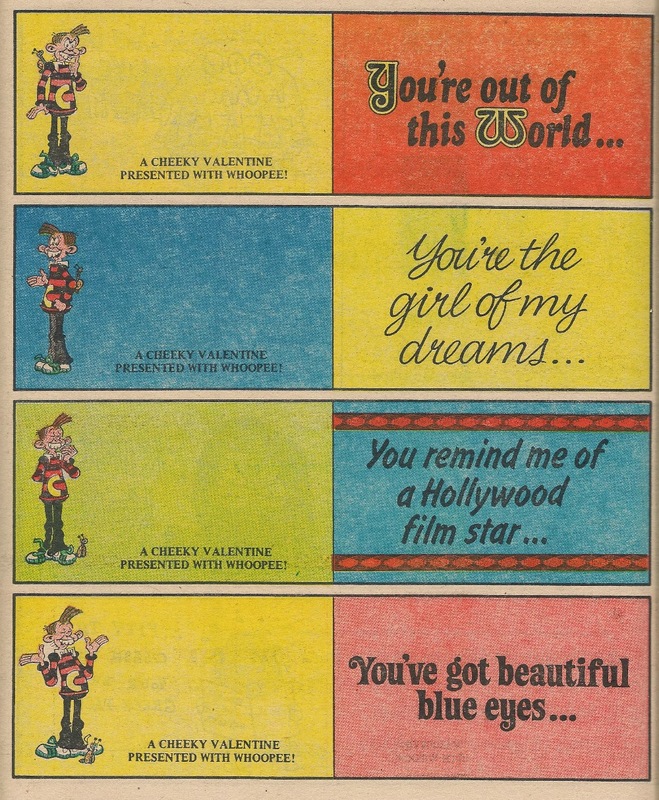 A week later, readers with a penchant for disfiguring their comics were no doubt eagerly excising the centre-page section from the appropriately-dated issue (which had of course gone on sale a few days earlier) in order to construct 8 very flimsy (in terms of both physical construction and gag quality) joke cards. Colour printing in IPC's comics of the period was usually restricted to the front/back covers, pages 9/24 and centre spread 16/17. Thus to make these cards work, the interiors of the cards whose fronts were shown on page 16 were printed on page 15, and pages 17 and 18 matched up in a similar manner. On the front of the cards, Frank McDiarmid draws the toothy funster in an interesting variety of poses. Sadly, I can't name the artist who did the internal art (may be the work of Michael Green, but I'm not sure). Instructions were printed on the Whoopee Chit-Chat page (14). 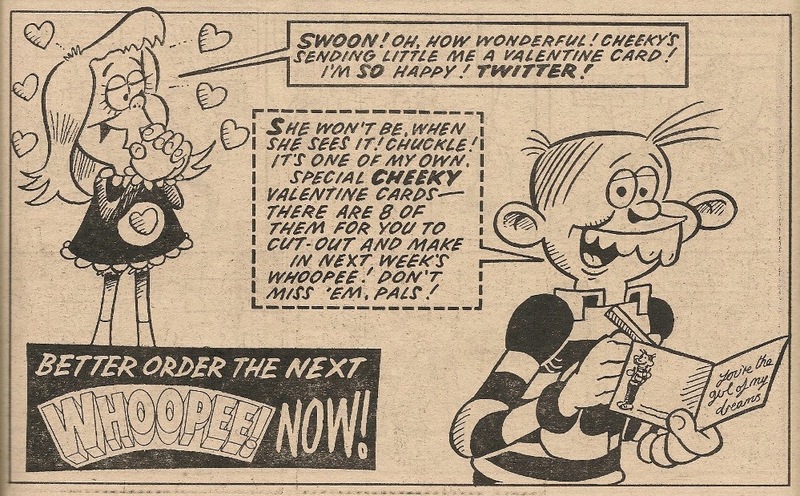 Readers expecting the Valentine's theme to carry over into Cheeky's strip in the same issue were disappointed to find that instead of a potential Cheeky/Louise storyline, our hero was working as a waiter in his 4-page escapade, entitled Service with a Smile (something our grinning chum could certainly provide in abundance), that week. The Wednesday element of Cheeky's Week occupied page 18 in the first 2 issues of Cheeky Weekly, but in the following edition the same location featured an advertisement for Timex watches bearing on their faces images of Hanna Barbera favourites Yogi Bear, Hong Kong Phooey, Fred Flintstone and Scooby Doo. Cheeky Weekly issue 4 saw the Thursday element of Cheeky's Week appear on page 18, and a week later in the 19 November 1977 edition the same Timex ad got its second and final outing, the manufacturers no doubt hoping a significant number of youngsters would be adding one of the watches to their Christmas present list. What's New Kids then ventured onto page 18 for one week before being replaced in the following issue by an ad promoting other humour titles from the IPC stable as Cheeky asked “Have you met my comic chums?” before introducing The Buytonic Boy from Krazy, The Bumpkin Billionaires from Whoopee! and Whizzer and Chips' resident prankster, Joker. What's New Kids then returned for a week before reader participation feature Joke-Box Jury moved in for two weeks. Thursday then made a fleeting reappearance for just one issue and the following week two IPC ads shared page 18 – one for football mag Shoot and the other reminding Cheeky Weekly readers that in addition to the four-part Spotter Book of Fun which had that week commenced in the toothy funster's comic, Spotter Books of different varieties were also launching in the current issues of Krazy, Whoopee! and Whizzer and Chips. The gagfest that was Joke-Box Jury then returned to page 18 for an eight-week chortle-packed run until, in the 11 March 1978 issue, the 500 winners of the Friends of Cheeky T-Shirt competition which had appeared in the 26 November 1977 comic were listed in a rather eye-straining page of tiny text. Joke-Box Jury returned for two weeks before What's New Kids and an ad for Mickey Mouse comic shared page 18. Joke-Box Jury was back for another 2 weeks, on the second occasion sharing page 18 with an ad announcing that Whizzer and Chips would be welcoming the survivors from Krazy into its pages the following week. In the 22 April 1978 edition, page 18 was once again home to a list of competition winners – this time it was those lucky readers who had pocketed £2 each for sending suggestions for a name for Cheeky's slimy sidekick, Snail. Any of the prize winners hoping to see their suggestions adopted in the comic would have been disappointed as none of the winning names were used in the Cheeky strips. Page 18 saw competition activity yet again the following week, but this time it wasn't results – readers were invited to identify 6 Cheeky Weekly characters seen in silhouette and riding on skateboards. 25 copies of The Hamlyn Book of Skateboarding were awaiting the successful entrants. Sharing the page was an ad for Arena Swimwear, featuring British Olympic gold medal-winning swimmer David Wilkie who was on hand to offer tips for the benefit of any tiddlers hoping to emulate his watery winning ways. Joke-Box Jury then moved back in for a week before another ad, this time for KP's crispy snacks Outer Spacers, supplanted it as of the next issue with news of a promotional tie-in with big-screen blockbuster Star Wars. In the 20 May 1978 issue the gagsters of Joke-Box Jury returned, but reduced to a half page in order to accommodate an ad for IPC girls' title Jinty, which was running a competition with £500 worth of Arena Swimwear as prizes. The indefatigable funsters of Joke-Box Jury then resumed occupation for a further week before being displaced in the 03 June 1978 edition by a page featuring 2 ads for IPC product; the Buster Holiday Fun Special and, in a World Cup year, the Shoot Scotland Special celebrating Scotland's qualification for the global soccer tournament (I suspect sales of that particular publication in England, whose national team had failed to secure a place in the finals in Argentina, were less than phenomenal). Page 18 was the site of further World Cup ad action in the comic dated 10 June 1978 as sports-centric title Tiger publicised the final part of its World Cup 1978 booklet in that week's issue – rather an odd choice to publicise the final part of a booklet, you might think, but IPC had been plugging Tiger's cut-out pamphlet in Cheeky Weekly every issue as from the week before it commenced (but not previously on page 18). Presumably IPC were conscious that this promotion would have attracted more interest had the England team made it to the finals. In the next edition, What's New Kids shared page 18 with an ad for Twirly, “The fantastic flying hover toy” from Humbrol, which looks from the illustration to be an elastic-band-powered balsa wood aeroplane but without the wings. 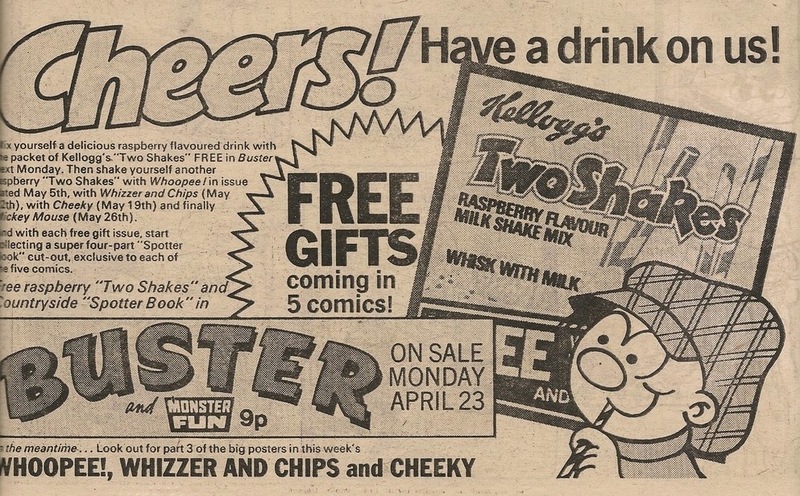 As Summer really gets under way, in the following 24 June 1978 issue Whizzer and Chips Holiday Special gets a plug on page 18, along with an ad for IPC's imminent Mini Comics promotion, designed to boost sales of IPC product over the holiday season. A further 2 IPC ads were to be found in the same location the following week – a second outing on page 18 for the Whizzer and Chips Holiday Special advert, plus an ad for the 64-page Best of Krazy, which was billed as an 'Extra Special'. The second page of a 2-page Creepy Sleepy Tale moved in to page 18 a week later, along with its ever-present companion, Wednesday (conclusion). A Creepy Sleepy Tale page occupied the same slot for 2 more weeks owing to the feature being displaced from its normal centre-pages location due to the presence of the aforementioned Mini Comics. Thursday then made its third and final visit to page 18 in the 29 July 1978 issue. The following week a 3-issue run of ads began in that location, featuring Rowntree Mackintosh's I-Spy competition, Trebor's Double Agents free fingerprint kit promotion and (to allow the tooth enamel of Britain's youth to recover from the sugary onslaught of previous weeks) a page devoted to the new sport-themed Top Trumps card games. What's New Kids resumed for 2 weeks, before sporadic filler Silly Snaps moved in followed by the final Joke-Box Jury on page 18, bringing to 16 the number of times the jury had visited that location (14 single-pages, 1 half page and 1 page 1 of 2, making J-B J the third most regular strip to populate page 18). What's New Kids was then back again. This brings us to the 30 September 1978 revamp issue, which saw the introduction of The Mystery Comic and consequent shuffling of contents, so it's not surprising that a feature new to page 18 (although not to the comic) turns up – Mustapha Million. Thus began what would be a 7-week page 18 run for Mustapha (6 weeks featuring the first page of our middle-eastern pal's 2-page adventure, and one week when Mustapha was reduced to a single-pager). 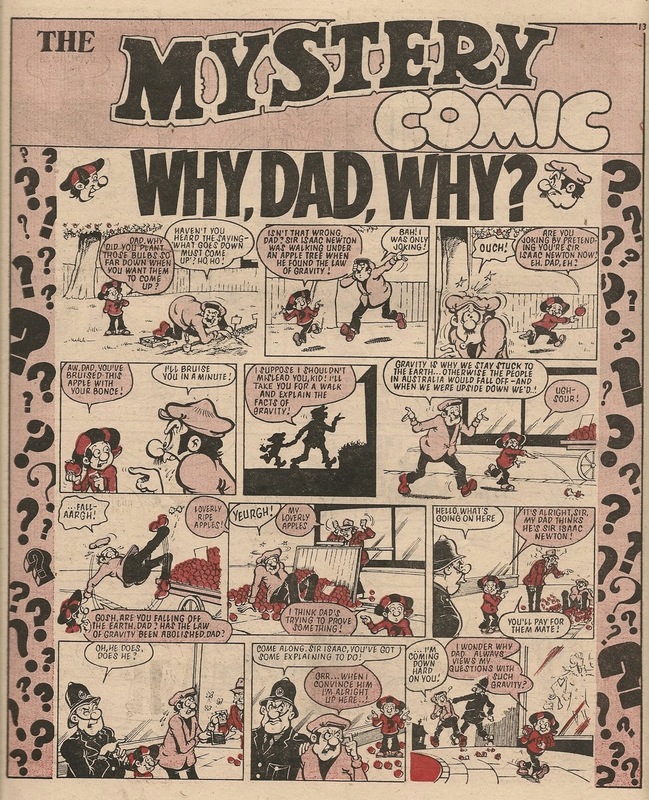 The 18 November 1978 issue saw fellow Mystery Comic star Mystery Boy get shifted on to page 18, but Mustapha was back in the next issue. A week later, in the first issue to be truncated due to industrial action, Calculator Kid took up occupancy, but was supplanted in the next edition (also suffering a reduced page-count) by Disaster Des. 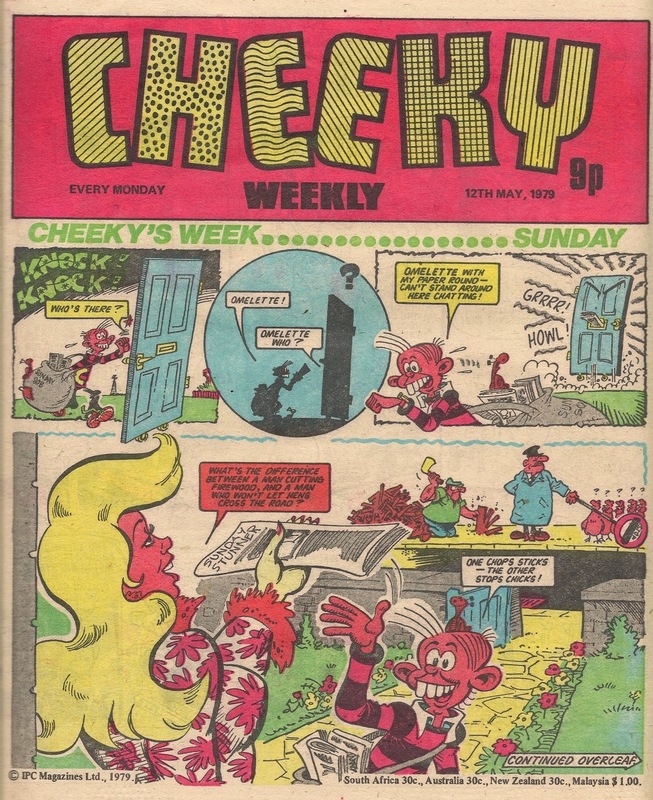 As the industrial problems worsened, Cheeky Weekly was among the IPC titles that were absent for the following 3 weeks, returning to the somewhat depleted newsagents' shelves with the issue dated 06 January 1979. In this edition a semblance of normality was restored as Mustapha and his millions moved back to page 18. However, things were shaken up just a week later as peripatetic pachyderm Elephant on the Run occupied page 18 for the first of what would be a 3-issue sojourn, whereafter Mustapha reclaimed the page for a single week before our grey skinned pal moved back for 2 issues. Not to be deterred, Mustapha regained control of page 18 the following week, and remained there for a further 4 editions, making way in the 31 March 1979 comic for Cheeky's jersey knitting pattern. Plucky Mustapha elbowed his way back onto page 18 in the following edition, only to be ousted by Disaster Des, making his second and final calamity-filled trip to the eighteenth page. In an unexpected move, Why, Dad,Why? replaced Des in the next issue, the father and son team making their only appearance in the location under review. 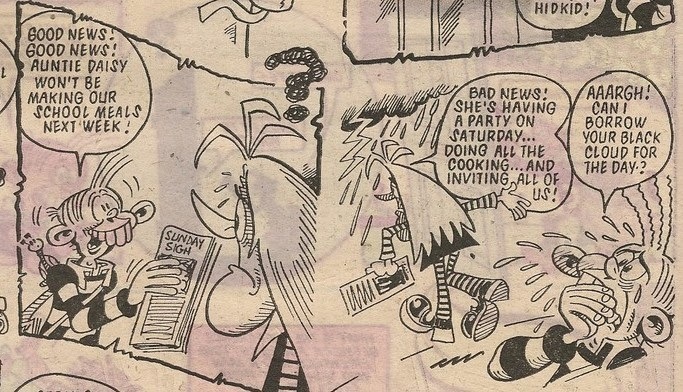 In the 28 April 1979 comic page 18 hosted an announcement advising readers of the commencement of a promotion in which a free sachet of milkshake mix would be given away with a different IPC humour title over the next 5 weeks. Our prosperous pal Mustapha returned in the next issue, followed by Elephant who was still on the run the week after that. An instalment of the cut-out-and-collect Cheeky Spotter Book of Town and Around (in an attempt to retain the custom of milkshake enthusiasts, each of the comics participating in the promotion commenced a different 4-part Spotter Book in each title's freebie-bearing issue) occupied page 18 for a single week, after which page 18 hosted a Star Guest appearance by Whizzer and Chips' Happy Families. Mystery Boy's World War 2 adventure then reappeared for a 2 week run until, in the 16 June 1979 Disco Issue, page 18 hosted part of the instructional section describing the new dance sensation, the Cheeky Hustle. Mystery Boy then returned for 2 weeks, bringing to an end his visits to page 18 (his story continued elsewhere in the comic in subsequent weeks). Cheeky Weekly's final revamp commenced with the 'new look' issue dated 07 July 1979. This overhaul brought to an end the Mystery Comic section in the centre of the comic, although all the Mystery Comic strips continued to appear (just not grouped in the middle of each issue as they had been for 37 weeks). 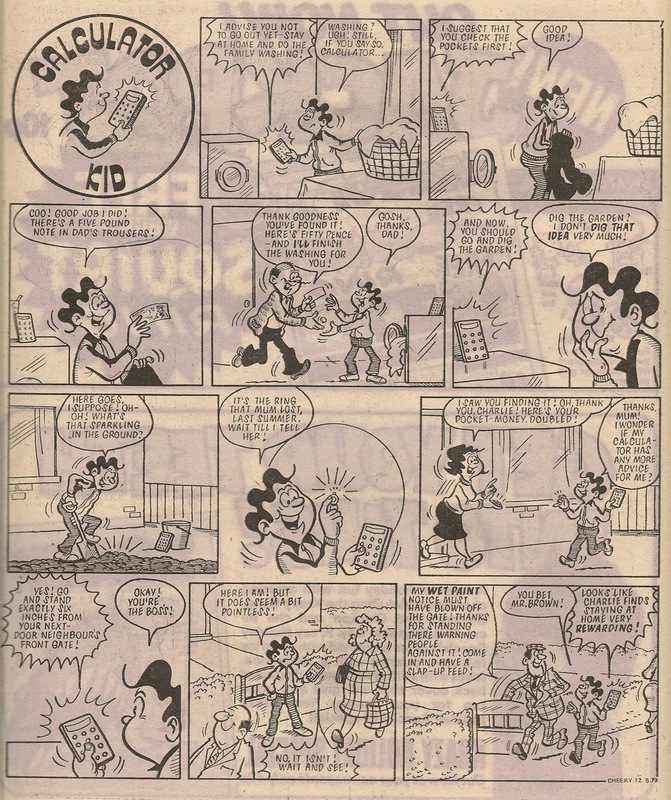 The rearrangement of the comic's contents led to a period of relative stability on page 18, commencing an 11-week run of the Wednesday element of Cheeky's Week, interrupted by one week of Mustapha in the 22 September 1979 comic, followed by a further, 5-issue, and final, run of Wednesday. Cheeky's mid-week merriment was the second most regular tenant of page 18, clocking up a coincidental 18 appearances in that location. Our affluent Arab chum made his final foray on to page 18 in the 03 November 1979 issue (the only occasion on which Mustapha was drawn by John Geering), then as the comic entered its final weeks, the last ad in that location appeared a week later – this time it was Weetabix who wanted to let Friends of Cheeky know that packs of their somewhat staid breakfast biscuits had been enlivened by inclusion of The Amazing World of Batman and Wonder Woman collectors cards. 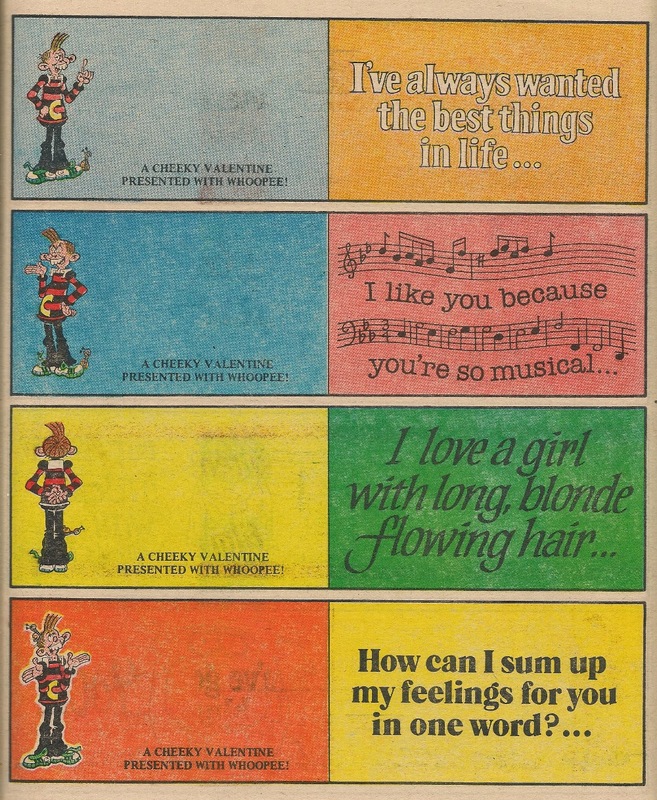 For the following 6 issues The Gang (retitled reprints of the Double Deckers strips from Whizzer and Chips) occupied page 18, but in the comic dated 29 December 1979 that site was reserved for a Christmas card to readers from Cheeky and pals, drawn by Frank McDiarmid. The Gang resumed occupancy for 3 weeks until in the penultimate 26 January 1980 edition, Mustapha made his farewell page 18 appearance (although he did return elsewhere in Cheeky Weekly's final issue), having been the most regular occupant in that location, clocking up 20 visits (19 of which featured page 1 of his 2-page adventures, plus one single page story). It fell to the revivified Double Deckers/Gang to host page 18 in Cheeky Weekly's final issue dated 02 February 1980.